The trail to Camp 5, the base camp for treks to the Pinnacles, starts in Kuala Birar. 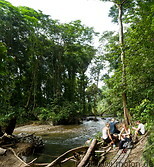 It is an easy 9km walk across the rainforest, running parallel to the Melinau river. Camp 5 offers basic Accommodation with open dormitories, toilets with cold showers and a common kitchen where visitors to the camp can cook.